Egg shells are a natural source of calcium, which is needed for effective cell regeneration and regulation of skin pigmentation. A clinical study in Germany observed a lower incidence of premature aging in people with higher levels of skin calcium. Japanese peel off mask helps to smooth and moisturize all skin types, especially those with dry or oily skin, sun spotting, and acne. 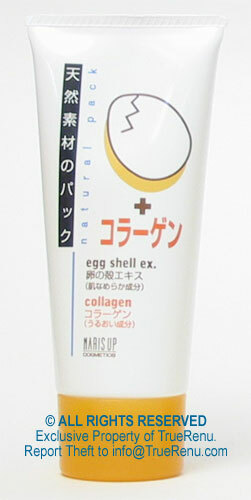 Egg shell membrane extract and collagen work to smooth and moisturize skin. Japanese package with translated ingredients and instructions. In-stock orders on their way to you quickly, with our money back guarantee. Eggshells are more than 30% calcium, an ingredient Western science has only recently linked to the skin's ability to fight the aging effects of free radicals. This gentle and easy to use mask from Japan also contains soluble collagen. Both calcium and collagen are already present in our skin, and produced in lower amounts as we age. We like Naris Egg Shell and Collagen Mask for its use of powerful natural ingredients, its ease of use, and how gentle it is for most skin types. The Japanese spend more per capita on skin care than any other nation in the world, including the U.S. Research of the skin's chemistry and aging is peerless, and this product is one result of that knowledge. You've already heard about the benefits of collagen, and perhaps calcium. If you'd like to try a hard-working product that contains both, this is the one. Cleanse skin and pat dry. Squeeze mask onto fingertip and apply thin layer over entire face, avoid areas around eyes, nose, brows, etc. Wait 10 minutes or until the mask is dry, then peel off from top to bottom. You can rinse, or follow with moisturizing, lightening, etc. Use no more than twice a week, and discontinue use immediately if your skin is irritated by use. Ingredients: This product contains preservatives: Water, polyvinyl alcohol, polyvinyl acetate, alcohol, sorbitol, PEG-20 sorbitan cocoate, sodium PCA, methylparaben, phenoxyethanol, dipotassium glycyrrhizate, hydrolyzed eggshell membrane, soluble collagen. Product Size: Net Weight: 100g, or about 3.5 ounces. A simple one-step treatment peel-off face mask made specifically for the oily T-zone. Deep cleans pores with charcoal and natural protein of eggshells. Removes dirt deep into pores. Refreshing cool finish.